It is unlikely to have been a secret to anybody that, as early as mid-August, events which could be qualified as a coup occurred in Novorossiya, which dramatically changed the political face of the Militia and of the Republic itself. 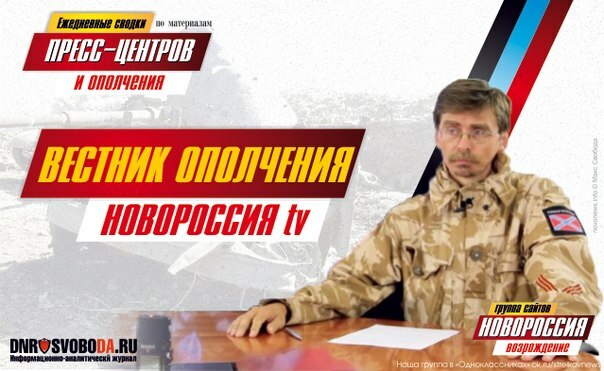 The TV program “Journal of the Militia” was shut down shortly thereafter on the insistence of the new Chairman of the Council of Ministers of the DPR and newly appointed Commander-in-Chief, Aleksandr Zakharchenko. On his personal order the author of these lines was forbidden from appearing on TV or speaking publicly on the subject of what is happening at the front and in the internal life of Novorossiya. However, closing down “Journal of the Militia” was only one link in the chain of eliminations of ideological work, which latter had been established in the Militia when the Commander-in-Chief had been Igor Ivanovich Strelkov. It is no coincidence that, from the very first days of the “new power”, rather emotional appeals by the new Commander-in-Chief resounded from the high tribunes of the Supreme Council and Council of Senior Army Officers—appeals to eliminate the Political Department of the Militia (created under my supervision), and to replace it with another structure of a fundamentally different ideological content (in place of the previous Orthodox-patriotic and strictly non-parti pris orientation). In light of all these events, a few days ago I and several other officers of Strelkov’s team came to a decision to submit our resignation letters, which decision we implemented there and then. I, and likewise many of my comrades in the Militia—both members and non-members of the Russian Common Military Union (RCMU)—are not indifferent to the way in which we fight. It is one thing to be led by a Russian officer, whom the Militia and people trust absolutely, in the name of the specific and clear aim of the liberation of Novorossiya. However, it is another thing entirely to continue military service under the command of dubious personages appointed by a third party, who are either known in the DPR as rear spinners, or who became infamous through their squalid intrigues against the former Commander, and who unfortunately can only lead the people of Novorossiya to a thoroughly disastrous political outcome. Therefore, I left my position as Combatant Service officer of the General Staff of the Armed Forces of the DPR with a clear conscience. Any other competent officer familiar with the staff work could replace me in this post. Alas, if the first task—our military victory—is, obviously, resolved on the battlefield, the second task, even in terms of the elimination of corruption and organized crime, let alone the creation of a positive political, economic and social model for Novorossiya, unfortunately seems already very difficult to achieve now, after the political, ideological and staff changes in the Republic. None of the above implies the slightest doubt of the need for a sacred fight for Faith, Honour and Freedom, in which the people of Novorossiya are currently engaged. One must be able to separate the wheat from the chaff. The question today for Russian patriots is not whether to support the struggle of Novorossiya or whether this fight is needed now under a changed domestic political environment, but how under the current adverse complications to carry the struggle to the maximum acceptable result. Each Militiaman at the front knows that we are not fighting against the Ukrainian people. The current war was from the very beginning provoked by the West and is conducted against their own population by those zombified by Ukie propaganda. Fed by the West, and at one time actively encouraged by the CPSU, the sectarian heresy of Ukrainian separatism brought a bloody harvest to Slavic lands. This evil must be stopped and destroyed. Puppeteers beyond the ocean are ready to continue the self-destruction of the Ukraine to the last Ukrainian soldier. But for all of the triune people this fratricide is the greatest calamity. We have repeatedly talked about the need for a speedy termination of the civil war. However, this issue should be resolved not by violating those rights won by the people of Novorossiya with their blood. Let historians and armchair “strategists” discuss now what the RCMU might or might not have been able to do in this war. We fulfilled what we believed was a matter of an officer’s honour and a duty to the Russian people. It does not end, the struggle continues!